A pair of impeccable bogey-free 65s on moving day have seen Joe Dyer's each-way pick, Anrea Pavan, and Padraig Harrington move three strokes clear of the remainder at the Czech Masters with a round a go. Here's the 54 hole leaderboard with prices to back at 11:00. Andrea Pavan is yet to win on the European Tour and back in 2011, he failed to win the Kamten Golf Open on the Challenge Tour, having led by seven strokes at halfway and by five with a round to go, but he's been impossible to fault from the front since. On one occasion in 2011 and twice in 2013 he led with a round to go on the Challenge Tour and he converted on all three occasions. This is far and away the closest he's been with a round to go on the European Tour though and it's hard to know how he'll fare but on all previous evidence, he shouldn't be the favourite against a three-time major champion who won on the European Tour less than two years ago. Looking back at Pavan's record in-the-mix on the European Tour, it's hard to imagine him pulling away in commanding fashion and he looks worth taking on to me. Way back in 2012, he fell from two back and fourth to 14th and six adrift at the Avantha Masters. At the 2013 South African Open he fell from fifth and four adrift to 37th and 14 back after a 78 in round four. In 2014, at the Russian Open, he fell from third after round three to eighth at the finish and on the two occasions he's been in contention this year, he's also gone backwards, falling fourth to 13th and from four adrift to six off the lead at the Qatar Masters and at the China Open in April he dropped from sixth and just two off the lead after 54 holes to 11th and five adrift at the end. Another reason to think Pavan might be the one to oppose this morning was his putting yesterday. He holed just about everything he looked at and I just wonder whether he can keep that up today. I suspect he might struggle to do so. 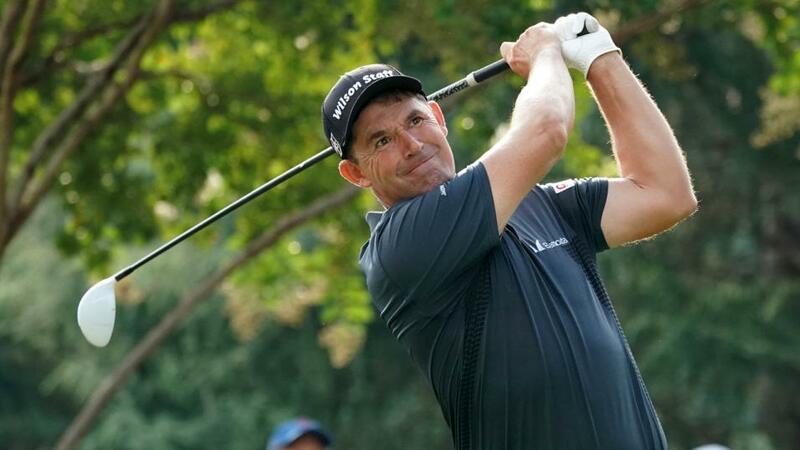 At 46, Padraig's nerves won't be what they once were but he looks the most likely winner to me and I'm surprised that he isn't the favourite. I was tempted to back him but it wouldn't be a huge surprise to see them both struggle. The European Tour is notorious for shaky Sundays and a case could be made for laying the pair and sitting back and seeing what happens but I'm not overly keen on the immediate chasers either. Like Pavan, Gavin Green is looking to win on the European Tour for the first time and Scott Jamieson, who's alone in fourth place, is nearly always atrocious in-the-mix. Having thrown money away yesterday on Matt Wallace, who was absolutely awful after he'd birdied the first, I'm happy to leave this event alone and see what happens but I have thrown a few pounds at both Tapio Pulkkanen and Eddie Pepperell at [65.0]. If there are any shenanigans from the leaders, either of those two are more than capable of capitalising. Over at the Northern Trust, with the leaders treading water and with both Bryson DeChambeau and Kegan Bradley shooting low rounds, there was much change on moving day in New Jersey and the leaderboard looks very different to the one at halfway. Here are the latest standings with prices to back at 11:05. Anyone that witnessed Bryson DeChambeau's horrendous late collapse on the European Tour last month, at the European Open, will be eager to take him on here at odds-on but I'm not convinced it would be wise to do so. Since 1996, 46 players have held a four-stroke lead on the PGA Tour with a round to go and 33 of them went on to win so DeChambeau is certainly not too short at around [1.7]. His wobble in Germany was quite something and he lost his swing completely but he'd been solid enough in-the-mix before that and I'm prepared to view it as a one-off. It won't be easy for DeChambeau to back up yesterday's sensational 63 but the same can be said of Kegan Bradley who sits alone in second after shooting 62 and none of the immediate chasers look especially threatening. DeChambeau is a perfectly decent price and I expect him to convert but I'm happy to leave the event alone after yesterday's bet on Dustin Johnson went as far amiss as my Wallace wager at the Czech Masters. Malaysia's Gavin Green is making the running at the halfway stage of the Czech Masters but with 11 players within three of the lead through 36 holes, including the 2015 winner and pre-tournament favourite, Thomas Pieters, his position at the head of affairs looks somewhat precarious as he attempts to break his European Tour duck. Joe Dyer's each-way fancy, Andrea Pavan, is alongside Pieters in a tie for third but it's Mike Norman's pick, Matt Wallace, that I like at this stage. I turned my nose up at the 25/1 available before the off and I thought I'd been correct to do so after he began the event slowly. The Englishman was matched at a high of [180.0] on Thursday but he flew through the field yesterday afternoon and thanks to a slow finish to his round (played the last six holes in one-over-par) he's now an attractive price going in to the weekend. Pieters is clearly the man to beat but since he won the third of his three European Tour events, at the Made In Denmark in 2016, Wallace has arrived on the scene and won three of his own. The confident 28-year-old followed last year's Open de Portugal win with victories in India in March and Germany in June and I just love his confident demeanour. Over at the first of the FedEx Cup Series events, the Northern Trust, world number two, Brooks Koepka, has moved in to a tie for the lead at halfway after playing his last seven holes of round two in six-under-par. Here are the latest standings with prices to back at 10:10. Brooks had drifted along inconspicuously for the first two thirds of yesterday's second round but after a birdie three at the par four 12th (the easiest hole on the course), everything clicked when he hit a three wood to 20 feet before making eagle on the par five 13th. "I wasn't happy the first 11 holes the way I hit it. When I hit that three wood, it all clicked. I felt like I was finally able to release the golf club. Just tried to hit as hard as I could, big draw. Aimed at the tree on the right and tried to draw it back to the flag. When I did that, everything started to click." If Brooks picks up from where he left off yesterday they may as well hand him the trophy right now but golf rarely works like that and the world number one and defending champion, Dustin Johnson, could represent a bit of value at in excess of 4/1 given he trails by just two. Despite missing plenty of fairways, DJ is playing some exquisite golf and but for two horror holes (the 17th on Thursday and the first on Friday) where he recorded a pair of triple-bogeys, he'd be clear in front an odds-on by now.